Leisure Industry Week (LIW) is the UK’s largest out of home exhibition dedicated to the entire leisure industry and will take place on the 24th-26th September at Birmingham’s NEC. Anytime Leisure has been working hard since last year to extend its network of trusted suppliers and expand the range of fantastic fitness and sport solutions on offer. For anyone who is attending the event, Anytime Leisure would recommend visiting the stands of some of our exclusive partners and key suppliers. Star Trac will be launching their exciting new Treadclimber, Boxmaster and the Spinner® Blade Ion Indoor Cycle at stand H530 during LIW. After huge popularity in the USA the Treadclimber is likely to be one of the main attractions at this year’s LIW exhibition. It possesses qualities of both a treadmill and a cross-trainer to increase hip and knee flexion, therefore overall muscle engagement. The Spinner® Blade Ion bike is set to cause excitement as well, thanks to its bike-mounted computer which will measure a rider’s power output and records workout data and there will be Spinpower™ demonstrations throughout the show. As of September 2013, Anytime Leisure is the official distributor for Power Plate machines in Scotland. Power Plate machines are the world leader in whole body vibration training equipment. At their LIW stand (H565) there will be various live demonstrations throughout each day, highlighting the diverse programming solutions of Power Plate products. Equipment featured will include the Power Plate pro7TM, the latest commercial model in the Power Plate range and the only piece of whole body vibration training equipment to feature an integrated touch screen which acts as an optional personal trainer that can take users through every stage of their workout. The pro7 machine also features embedded, multi-directional proMOTIONTM cables for enhanced upper body work. Another Anytime Leisure supplier, Cybex International, will be present at LIW2013 on stands H555, MR1 and MR5. The manufacturer who brought us the incredibly popular Arc Trainer plan to unveil their new “performance plus” treadmill, the 790T. The 790T offers their widest range of speed settings to allow for sprint training and greater levels of incline (up to 20%) for walkers who want an additional challenge. Functional Fitness specialists Jordan, who supply many of Anytime Leisure’s most popular free weights and accessories, will be exhibiting their latest range of products at stand H475. 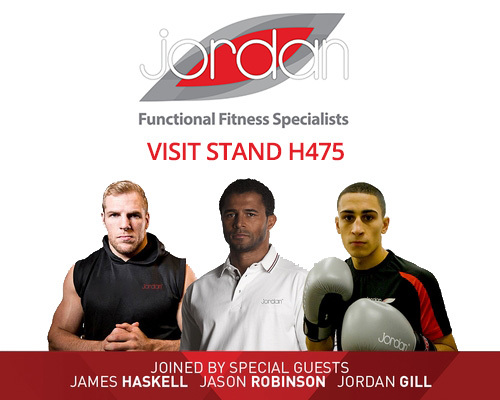 The Jordan stand will be run by their expert staff who are to be joined by special guests including rugby union players James Haskell and Jason Robinson, along with boxing star Jordan “The Thrill” Gill. Also on offer are a series of demo sessions looking at how to make the most of your functional training and Jordan fitness equipment. Some of the topics Jordan experts will be discussing are Dynamic, Functional HIIT and Combat Fitness Training. Make an appointment with Anytime Leisure at LIW2013: If you would like to make an appointment with one of our team please email sales@www.originfitness.com. This entry was posted in News and tagged LIW, Leisure Industry Week on 11th September, 2013 by Colin Evans.